The ARTIST ROOMS: Roy Lichtenstein exhibition at the Scottish National Gallery of Modern Art closes on Sunday 10 January 2016. Come and enjoy the final day of the exhibition with the interactive Artcasting project. Drop in any time between 2pm and 4:30pm to connect Lichtenstein to your world! Artcasting is a mobile app that helps visitors explore a response to artworks by sparking new and imaginative connections between art, time and place. The Artcasting project team from the University of Edinburgh will be on hand to talk with visitors about the project and the app. The app is in development, and currently available for Apple (IOS) only. 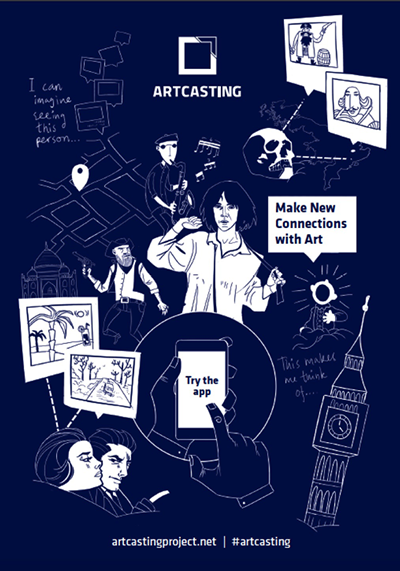 If you have an IOS device (iPhone or iPad, preferably including a mobile/3G connection as well as wifi), download the Artcasting app before the event at https://itunes.apple.com/gb/app/artcasting/id1043020610?mt=8 or simply search for Artcasting. If you don’t have your own, we will have a limited number of devices you can use. Bring your phone/tablet to the Resource Room in Modern One on the afternoon of Sunday 10 January. Enjoy the exhibition, try Artcasting, and talk to the team! Bring: an iPhone or iPad if you have one, with Artcasting installed: https://itunes.apple.com/gb/app/artcasting/id1043020610?mt=8 .